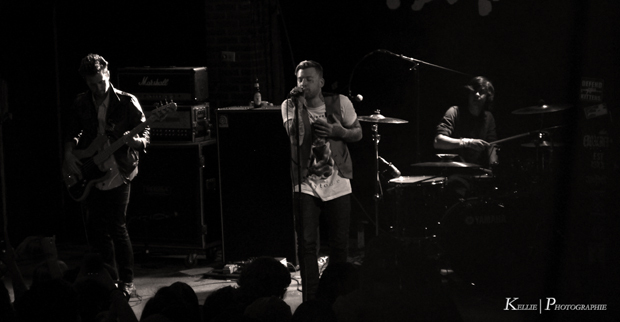 Under The Gun sent Head of Photography, Kellie Gannon, to the Jonny Craig Tour on March 27, 2013 in Cleveland. What does a reformed bad boy do when he cleans up, gets sober, and puts music first in his life? Embarks on a solo tour, that’s what. Jonny Craig hit the road this spring on a solo tour with support from The Seeking, Hail The Sun, and Kurt Travis. I had the opportunity to catch this tour as is made it’s way through the home of Rock and Roll. Jonny Craig stopped by Peabody’s in Cleveland on March 27, the day after his birthday, to perform an unforgettable set with a group of extremely talented musicians. Hail The Sun took the stage and jammed out from the get go. Their sound was refreshing, and not completely what I was expecting on this tour, so I was pleasantly surprised. They instantly reminded me of a mix of Fall of Troy and Sleeping With Sirens, with a hint of Circa Survive tossed in. What was even more awesome was that drummer Donovan Melero also doubled as the band’s lead vocals. His voice combined with the drumming was out of this world and breathtaking. I found myself wishing their set was longer, and much to my delight they also stuck around to play onstage for Kurt Travis, as well as Jonny. Kurt Travis‘ performed a very soulful set, mostly acoustic with partial background sound from the Hail The Sun fellas. His brand of acoustic rock is one I haven’t really heard in awhile. It focused on the simplicity of the melodies, guitar riffs, and meaningful lyrics, while getting the crowd in a very chill mood. The vibe from Kurt Travis’ set transitioned very well into Jonny’s set. Jonny took the stage to a small but very excited crowd. Beginning his set with “I Still Feel Her Pt. III” and transitioning into a few covers including Justin Timberlake’s “Cry Me A River” and Amy Winehouse’s “Rehab,” Jonny also began to get emotional after “Children Of Divorce.” Pulling himself together, he ended the show with new hit “Nobody Ever Will.” His vocal range, lyrics, and raw emotion onstage provided a very deeply moving show for the fans in attendance. Photos from this tour are below, with the full set here. Enjoy! !